Second half goals from Presnel Kimpembe and Kylian Mbappe secured victory for the French champions, with Paul Pogba sent off for two yellow cards late on. United’s revival with 10 wins in 11 games under interim manager Ole Gunnar Solskjaer raised hopes that this was the night they could reclaim their place in Europe’s elite. Instead, they were outclassed by PSG to suffer their first European home defeat by a margin of more than one goal and will now need to produce something remarkable in Paris on 6 March to stand a chance of advancing to the Champions League quarter-finals. Solskjaer’s hopes were hampered by first-half injuries to Jesse Lingard and Anthony Martial but PSG made light of the absence of injured Brazilian superstar Neymar and striker Edinson Cavani. Solskjaer has done a remarkable job in transforming the mood and performances since succeeding sacked Jose Mourinho in December – but this was his toughest night since he arrived back at Old Trafford. It was no reflection on Solskjaer that United lost, they were simply the victims of a better team that still possessed an outstanding attack in the shape of Di Maria and Mbappe, even in the absence of Neymar and Cavani. Solskjaer and United’s cause was not helped by injuries to Lingard and Martial in the opening period, the latter particularly damaging given his brilliant recent form. United could not be faulted for effort or character but they simply did not have the weapons to trouble Thomas Tuchel’s side as they exposed United’s defence through the width and delivery of Di Maria and the irresistible speed of Mbappe. Solskjaer will not give up hope ahead of the second leg in Paris but logic suggests this is the end of the road for Manchester United’s Champions League ambitions. Man Utd v PSG: Who topped player rater? Di Maria’s frustrating spell at Manchester United after a then British record £59.7m move from Real Madrid was reflected in the barrage of jeers that accompanied him throughout this Champions League tie. The Argentine, often poorly utilised by manager Louis van Gaal, lasted only a year before leaving United for Paris in a £44.3m deal having never produced his finest form. Here, to their pain, Manchester United and their fans witnessed exactly what they could have had. 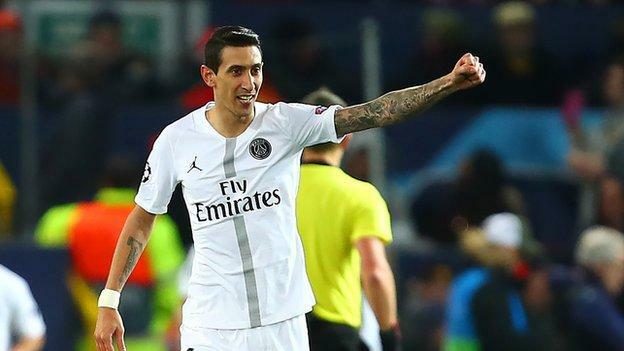 Di Maria shrugged off the abuse, and a needless barge from Ashley Young that sent him flying painfully downhill and into Old Trafford’s cinder track in the first half, to make contributions of real significance in PSG’s win. And how he enjoyed it. It was his corner that fell to Kimpembe for the opener and he showed what he was really all about when he outpaced United’s retreating defence and put the second on the plate for Mbappe as he arrived with perfect timing. On Pogba’s sending off: “Paul Pogba is trying to get his body across and Dani Alves is clever enough to put his foot in there. Paul wants to shield the ball, he’s unlucky. “Mountains are there to be climbed, you can’t lay down and say this is over We will go there, play our game and improve from today. PSG boss Thomas Tuchel: “We lost too many easy balls in the first half but the second half was really excellent. Ole Gunnar Solskjaer registered his first defeat as Man Utd boss in his 12th game in charge in all competitions (W10 D1 L1), with this Man Utd’s heaviest ever home defeat in any European competition. Paris Saint-Germain became the first French team to beat Manchester United at Old Trafford in any European competition (D4 L10 before tonight). Since the start of the 2016-17 season, only Cristiano Ronaldo (16 goals) has scored more goals in Champions League knockout matches than PSG’s Kylian Mbappe (7). Mbappe became the third player to score in his first three away Champions League appearances in England, after Luis Enrique and Edin Dzeko. None of the previous 34 teams to lose the first leg of a Champions League knockout match at home by two or more goals have progressed. Solskjaer is just the second Manchester United manager to lose his first Champions League match in charge, after Louis van Gaal (Ferguson, Moyes and Mourinho all won). Angel Di Maria registered two assists in a Champions League match for the third time, and the first time since September 2013 (for Real Madrid vs Galatasaray). Gianluigi Buffon became the fourth player to appear in the Champions League aged 41 or older (after Marco Ballotta, Mark Schwarzer and Oleksandr Shovkovskiy); he made his debut in the competition before two of the players starting the match were born (Marcus Rashford and Kylian Mbappe). Kylian Mbappé (Paris Saint Germain) wins a free kick in the attacking half. Offside, Manchester United. Juan Mata tries a through ball, but Alexis Sánchez is caught offside. Substitution, Paris Saint Germain. Colin Dagba replaces Ángel Di María. Attempt missed. Juan Mata (Manchester United) left footed shot from outside the box is close, but misses to the right. Assisted by Nemanja Matic. Attempt saved. Kylian Mbappé (Paris Saint Germain) right footed shot from the right side of the box is saved in the bottom left corner. Assisted by Ángel Di María. Goal! Manchester United 0, Paris Saint Germain 2. Kylian Mbappé (Paris Saint Germain) right footed shot from the centre of the box to the bottom right corner. Assisted by Ángel Di María.